Tightwad was eying up her fridge and realized how much veg she has ... and decided to try something new. 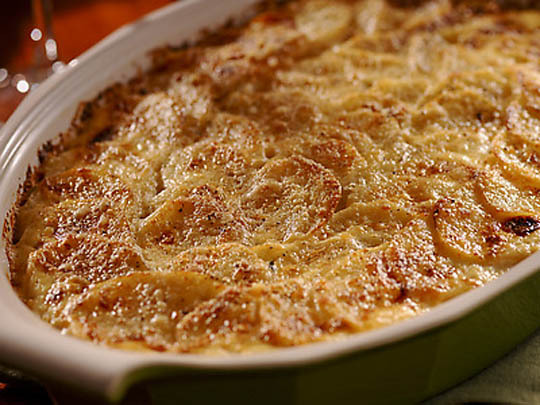 Use enough potatoes and other veggies to fit your casserole dish. Tightwad used zucchini, yellow onion, garlic, baby bok choy, a few left-over tomatoes, celery... all diced, and sauteed in about one tablespoon of butter with some salt and pepper until soft. Once the potatoes have boiled, drain and layer half in your casserole dish. Then layer with sauteed veggies, and top with rest of the potatoes. Cover with shredded cheese and breadcrumbs. Bake until bubbling.